Find a Sto-Fen Product for your flash! Order Sto-fen product at our On-Line Store. You can order from our complete line of products on-line and have them delivered right to your home or office. 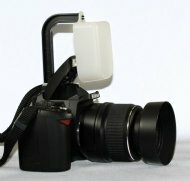 STO-FEN Products Manufacturer of the Omni-Bounce, the top choice of many of today's working photographers. Offering photographers a chance to get the best possible light from their flash with out having to carry cumbersome equipment. The Sto-Fen line is custom designed to fit most of the popular flash units. And NO Velcro is ever required for attaching the units to your flash. Nikon SB-28 Flash "Bounce Flash Specialists"
The complete line of STO-FEN Bounce Products are designed to fit most of today's popular portable strobes. Custom fitting so you never have to use Velcro on your Strobe. Small and Compact enough to Fit easily into your pocket or gadget bag. We are always expanding our flash listing page! Visit our Flash Listing Page to view a list of Flash Models. You may print out the information and order sheet, and Fax or Mail your order to us for fast results. For the fastest results visit the Sto-Fen On-Line Store!! !